Outdoor picnics are one of summer’s greatest pastimes. They’re a time to enjoy the outdoors, catch up with friends and family and get a change of pace and scenery. However, they can also be tricky venues to navigate if you’re following a specific diet—either for weight loss or other health needs. We’re breaking down three common summer picnic dilemmas and how you can navigate them this season. You’re trying to eat healthy. The key to attending a picnic when you’re focused on eating a clean or specific diet? Come prepared. If you can, eat a meal before leaving the house and pack snacks for backup, such as a handful of almonds or a granola bar. Having a healthy option in your bag should hunger strike will keep you from being tempted by the picnic’s dessert table. If you do eat from the picnic’s selection, be sure to load up on water, fruits and vegetables first. This will keep you from getting dehydrated and reaching for more food than you normally would. Lastly, take a lap around everything that is offered before filling your plate or grabbing a handful of anything. This way you can decide what you plan on eating and can pace yourself accordingly. You’re vegetarian (or have another dietary restriction). From vegans and pescatarians to the rise in gluten-free and paleo diets, it’s unlikely a picnic can cater to everyone’s eating habits. If you receive a more formal picnic invite, such as a company or team picnic, it’s OK to let the host know about your restrictions. Something as simple as “I’ll be there! Happy to contribute a vegan dish for the group.” This way the host won’t be blindsided when you show up with a meal and lets him or her coordinate with you over the meal. It also gives them an opportunity to let you know if there will be a variety of food options for you. If the picnic is more informal, or potluck style, it’s acceptable to bring your own dish without warning. Consider bringing a description tag to let anyone else with your restriction know they can enjoy the treats too. Picnics are a tricky venue for individuals with food allergies. Many dishes tend to be unlabeled and even store-bought items have typically been removed from their packaging. Similar to dietary restrictions, it’s acceptable to tell a smaller, more organized picnic host about your food allergies. He or she can both cater to them and pass the word to other invitees to ensure food items are either free from your allergy or are clearly labeled. At a larger picnic, it might be safer to come prepared, either by eating before or bringing your own approved dish, to eliminate all doubt. 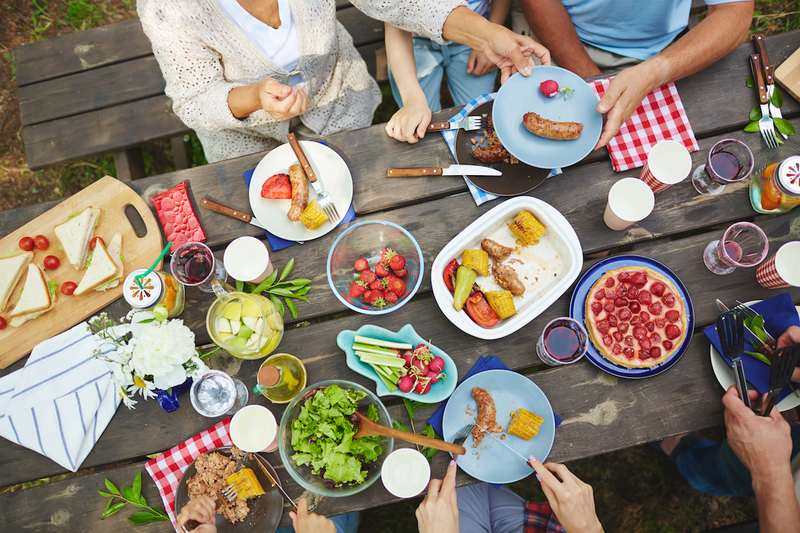 For any and all picnic adventures this summer, be sure you keep food safety top of mind—keep it cool! Food cannot be out for more than two hours, and only one hour if the outside temperature is over 90 degrees. And if you’re contributing a signature dish to a picnic this summer, consider stopping by your local farmers market for tasty produce. Make the most of your farmers market trip with tips from this blog post.